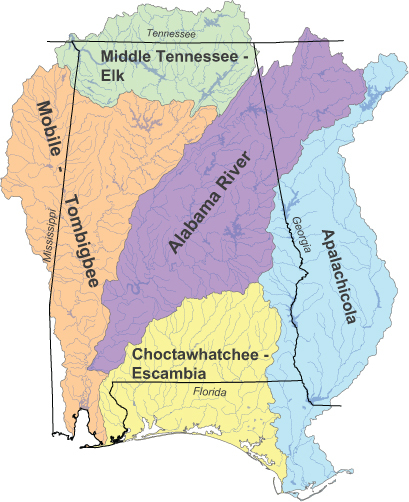 The 59 Strategic Habitat and River Reach Units are found in five major sub-regions: Middle Tennessee - Elk, Mobile - Tombigbee, Alabama, Choctawhatchee - Escambia, and Apalachicola. Each of these sub-regions is also referred to as hydrologic unit (HU). Specifically, the United States Geological Survey has defined these sub-regions at the HU-4 level. Alabama is home to 85 known species of crayfish, the largest number of species of any state or political province in North America. Crayfish are freshwater crustaceans and are similar to crabs and lobsters. Alabama is home to more than 450 species of fish. That is more than any other state or province in North America. What makes the fish so diverse in this state is the large network of rivers, streams, and lakes, diverse geology, high amount of annual rainfall, and the temperate climate. There are about 1,000 total known species of freshwater mussels with approximately 300 of those from North America. Alabama is the state with the greatest diversity of mussels with 181 species. Reptiles are cold-blooded (body temperature is not internally regulated and therefore is similar to that of the external temperature), usually egg-laying vertebrates having an external covering of scales or horny plates and breath by means of lungs. Alabama is home to 93 native reptiles. Amphibians are cold-blooded (body temperature is not internally regulated and therefore is similar to the external temperature), smooth-skinned vertebrates that characteristically hatch as an aquatic larva with gills. The larva then transform into an adult having air-breathing lungs. Alabama is home to 73 amphibians, including 30 species of frogs and 43 species of salamanders. North American freshwater snails (Gastropods) are a critically imperiled faunal group with 74 percent listed as vulnerable, threatened, endangered, or extinct in the most recent American Fisheries Society assessment. Of the 703 species known from the United States and Canada, 204 are known from within the state of Alabama.